TEHRAN, Iran (CNN) -- Days after Iran revealed the existence of a second uranium enrichment facility, the head of the United Nations' nuclear watchdog agency paid the country a visit. IAEA Director General Mohamed ElBaradei will discuss Iran's newly revealed enrichment facility. Mohamed ElBaradei, director general of the International Atomic Energy Agency, arrived in Tehran on Saturday night for two days of talks with Iranian officials, the semi-official Iranian Students News Agency said Saturday. An IAEA spokesman said officials were planning to discuss the new underground facility near the holy Shiite city of Qom. Iran sent shock waves through the international community last week when Tehran wrote a letter to the IAEA revealing the Qom plant's existence. During the two-day trip, ElBaradei will meet with Ali Akbar Salehi, who heads Iran's atomic energy agency, and other Iranian officials. 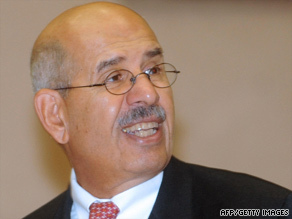 It's unclear whether ElBaradei will visit the facility. Iran has said it plans to cooperate with the IAEA and will invite its inspectors to visit Qom. Iran says its nuclear program is intended for peaceful purposes, but many in the international community have accused the country of trying to develop nuclear weapons capability. Iran conducts research for its nuclear program in sites across the country. Until the latest letter, Iran had acknowledged only a uranium enrichment plant in Natanz, which nuclear inspectors visited recently. Iran also has an unfinished nuclear research reactor in Arak, and U.N. nuclear inspectors were allowed access to that facility this month.